A screenshot from the DC Eagle Cam shows Victory and Valor perched in the tree where they were born on July 23, three days before Valor fell from a branch. It wasn't necessarily a cause for alarm. Valor's sibling, Victory, had "accidentally fledged" a few weeks earlier — that is, the bird fell from the nesting tree by accident but learned to fly as a result, returning to the nest the next day. Valor didn't seem to be flying back, however. The next morning he was located, damp from the rain, on the ground beneath the tree. He was spotted later in a nearby tree. Then, on July 30, he was found on the ground several blocks away, in a residential neighborhood. There were no obvious injuries, but experts decided to hold on to him for a few days to monitor his health before he was placed back in the nest, as The Washington Post reported at the time. His new exploits were treated like one big lark. Everyone assumed the bird would be fine — and, soon enough, would learn to fly on his own, just like Victory did. But it was not to be. Something was wrong with Valor. He was transferred to a bird rescue and research facility, which reported that he was severely underweight and anemic. The bird's fans watched and waited nervously, to see whether he would recover. Mr. President and the First Lady have been raising young eaglets in a picturesque tulip poplar in the National Arboretum — a spot they picked themselves, for the record — since the spring of 2015. 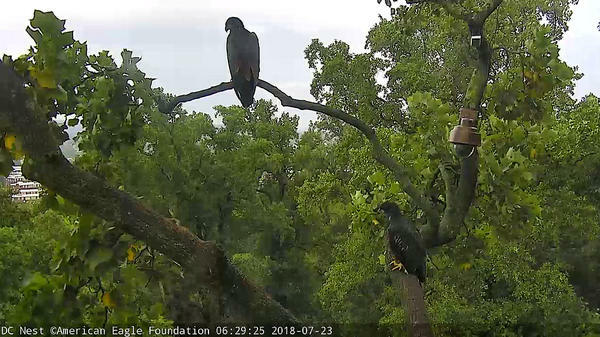 The DC Eagle Cam, organized by the American Eagle Foundation, has been broadcasting their family life on the Internet since 2016. Passionate NPR.org readers might remember that first season in the nest — we covered every pip and every hatching of eaglets Freedom and Liberty. The next year, Mr. President and the First Lady raised Honor and Glory, again before a long-distance audience. So by the time they emerged from their eggs this spring, Valor and Victory had already inherited a crowd of eager eagle-watchers who had followed the avian first family for years. This year, they watched Victory and Valor from the time they were eggs, carefully guarded by their parents, through the thrill of the first shakes of the hatching egg. They watched as the birds grew into fluffy chicks, then sleeker, darker young birds, making their first tentative hops toward flight and freedom. And now, the DC Eagle Cam community grappled with its first real tragedy. Valor wasn't gaining weight. His condition was "very poor," Tri-State Bird Rescue & Research said. Some eagle-eyed cam-watchers wondered whether the health problems dated to days in the nest when Valor didn't seem to get his full share of food; the equity of food division in the nest is a common anxiety among eagle cam observers. Or was the fall a symptom of something more ominous? "We know that many are concerned about the prognosis for this eaglet," the group said on Monday. "We are doing all we can, but despite intensive medical treatment and nutritional support over the past three days, Valor has shown no improvement and his prognosis remains guarded." The bird experts understood that the public was blindsided by this news. " We know his decline may seem sudden to many people," they explained. "Wild animals are adept at hiding injury" to avoid being targeted by predators and can "appear bright and alert" despite being in ill health, they said. On Tuesday, they released their final update. Valor had been lethargic. He had no appetite and had to be force-fed. His head and body were trembling. He tested positive for West Nile Virus, which can be fatal in birds, the facility said. The wildlife experts said it was "extremely unlikely" that he would recover and that "prolonging his suffering would have been inhumane." He was euthanized on Tuesday. "Words are not enough to convey the sadness we are feeling for the loss of our precious eaglet, Valor," the American Eagle Foundation said on the DC Eagle Cam website. The group said euthanizing him was "the most difficult but compassionate decision." "We are thankful for the opportunity to finish the 2018 season watching Mr. President, the First Lady, and Victory," AEF wrote. "Rest gently, Valor. You were loved." And he was. He really, really was. On Facebook, mourners called him "beloved Valor," "precious Valor," "sweet baby Valor." One dedicated a statue to him. They reminisced about watching him grow from the day the eggs were laid, recalling how bravely he had endured heat and cold, wind and rain. "I wish I understood how one little bird's passing could rip a hole in one's heart," one woman wrote on Facebook. "I will picture him flying above the clouds, knowing he fledged directly to heaven," another wrote. "However short his life was, he brought joy to many around the world," wrote another fan. "That will be his legacy."